The Third Eye Chakra is located in the centre of your forehead, just above the eyebrows running from front to back. 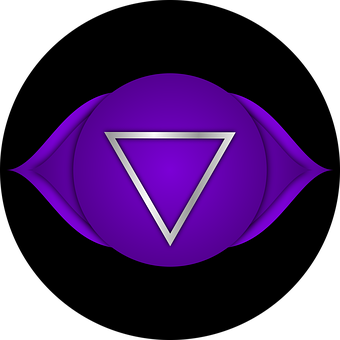 The colour that is associated with this Chakra is purple. The symbol attached is the symbol that represents the Throat. This Chakra is connected to our third eye, our third sight, foresight and our intuition. The Sanskrit name is Ajna. Working with your Third Chakra you would be best suited to use purple crystals. Hold them in your hands carry them with you, wear jewellery with blue stones in, place them just below your belly button whilst you meditate. Walking in nature or on grass without footwear helps ground you. Do it regularly to see the difference.